Moving to a new home can be stressful enough, but when you’re moving with kids, things can be even more hectic. 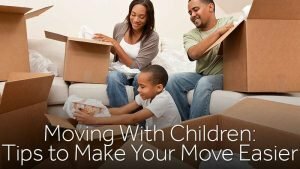 In order to make sure you stay organized and your kids stay calm while planning your move, keep the following moving tips in mind. Before you start packing everything up, take time to let your kids know about the move. Younger kids might have trouble understanding what will happen, so it’s important to help them feel that moving is something to look forward to. Older kids might be upset at having to change schools or leave friends behind, so emphasize the positive points about the move. When you’re figuring out how much time you need to get ready for moving with kids, give yourself some extra time. 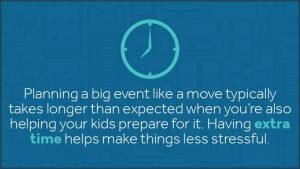 Planning a big event like a move typically takes longer than expected when you’re also helping your kids prepare for it. Having extra time helps make things less stressful. Give your kids backpacks or smaller suitcases to fill up with their favorite items. This helps reassure them that these treasured items won’t be left behind. It also ensures that they’ll have something to keep them occupied if you have a long drive to your new home. When packing up your kids’ belongings, be specific about the items that are in each box. Rather than giving them general labels, such as “toys” or “books,” mark down a few phrases that describe what’s inside these boxes. This will help you find your kids’ specific belongings faster and make it easier to unpack everything when you get home. While you might be eager to pack as much as possible to get it out of the way, don’t pack up all of your kids’ toys early. Otherwise, they’ll be bored and restless while you’re trying to get everything else packed. Leave some toys out until moving day, then put these in a box or bag right before you leave. Have extra clothes handy on the day of your move. Whether your kids spill a drink on themselves or get dirty playing outside while the truck is being packed up, having a change of clothes with you means you won’t have to rummage through sealed up boxes to find clean clothes. When it’s time for your move, contact Zippy Shell for a quote. We offer portable storage and moving services in the Columbus area that can help your move go more smoothly. Keep in mind that we beat competitors’ prices by 20 percent. Also, if you already have storage and pay more than $149 for it, we’ll beat that price by 20 percent AND move your belongings at no charge. Call us today for more information!